Phoenix Audio’s products have appeared a few times in the pages of Sound On Sound, and I first came across them over 15 years ago when I reviewed a two‑channel mic preamp with integrated active DI, called the DRS2 (SOS February 2003). You can find out more about the company’s history in the ‘About Phoenix’ box later on. The device under the microscope here is their eight‑channel rackmounting active DI. Called the N‑8, it borrows from the company’s long‑established Nice DI, a two‑channel device which employs the active Class‑A DI stage first introduced in Phoenix’s DRS‑series products. The overriding ethos for this bespoke DI design was to maintain musicality and character for instrument sources, using elegant, discrete circuitry with a wide bandwidth and excellent handling of transients and micro‑dynamics. Though the N‑8’s circuit design is very similar to the Nice DI, it’s not entirely the same and includes several new features, including ground lift, polarity invert and input pad facilities. At its core, the input stage is transformerless and presents an unusually high 10MΩ input impedance, while the output stage features the well‑proven DSOP‑2 amp, with its custom‑wound DB694 output transformer. The N‑8’s circuitry is housed in a black, 1U, rackmounting steel chassis, which is 1.2mm thick and extends around 210mm behind the rack ears. Given the requirement for eight output transformers, it’s not surprising that it weighs almost 5kg, with a good deal of the weight towards the rear — some support at the back of the unit might be a sensible precaution, especially if you plan on installing it in a touring flightcase. The rear panel is very simple, being equipped with just two AES59 (Tascam 25‑pin D‑sub) connectors, one labelled as ‘Outputs 1‑8’, and the other as ‘Monitor O/P 1‑8’. The main Outputs socket provides transformer‑isolated, floating and balanced line‑level outputs, which are intended to serve as the main recording or FOH feeds. Eight illuminated (red) buttons on the rear panel allow, on an individual basis, the connections between the cable screen and the chassis earth to be broken to mitigate ground loops. In contrast, the Monitor O/P socket provides secondary outputs that are 8dB lower in level than the main ones, the idea being that connected monitoring equipment won’t be overloaded if the main outputs are driven hard. Although the Owner’s Manual claims these monitor outputs are balanced, it doesn’t make clear whether they are transformer‑isolated feeds, or whether they are affected by the ground‑lift buttons. However, it turns out that these monitor outputs are actually derived from a centre‑tap on the primary side of the output transformer (which accounts for the reduced output level). So they’re actually direct outputs, rather than transformer isolated. Technically, they’re also unbalanced, but the wiring at the D‑sub connector adopts a common approach in which the output signal is presented on the hot output terminal and the audio ground on the cold terminal. To help avoid ground loops, there is no cable screen connection at the N‑8’s connector. This configuration is common practice and generally works perfectly well with both balanced and unbalanced equipment, and I have no issue with it in principle. That said, there are specific situations where it won’t work, and as the Owner’s Manual is rather light on information in this respect it could lead to bewilderment and a lot of head scratching in such situations. If Phoenix were to update the manual to include a detailed description — or better still a detailed block diagram — it would remove the potential for confusion. Both the main and monitor outputs are delivered via D‑subs. Although each output is tapped from a different side of the same transformer, the design means that they always sound identical, differing only in level. Each channel’s controls feature two illuminated buttons, the first (which is blue) selecting a ‑15dB pad, and the second (green) a polarity inversion. An unusually slim and tall red‑winged knob, lending a Neve‑esque air to the N‑8, adjusts the gain of the output stage, but there are no level meters of any kind. As I mentioned above, the internal construction is a bit of a squeeze, but it is done very neatly. 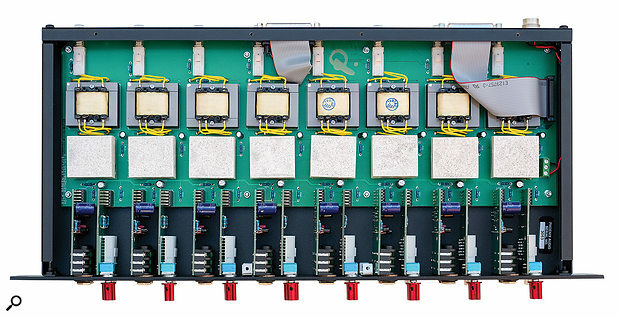 The DSOP‑2 output electronics and transformers for the eight channels are mounted on a single motherboard which stretches across the full width of the chassis, with two short ribbon cables at the back to carry the outputs to the two D‑sub connectors. At the front, the input circuitry for each channel is mounted on a pair of vertical daughter cards, with one carrying the channel’s buttons and level control, and the other hosting the two sockets and the discrete input buffer electronics. These cards plug into sockets on the main PCB, so servicing should be fairly straightforward. I was expecting the instrument input circuitry to use a FET at the front end to achieve the very high input impedance, since this is what most discrete DI designs do. However, although FETs were tried for this role early on in the development of the Nice DI, they didn’t deliver the desired musical colour and depth. While Phoenix Audio are naturally a little reluctant to disclose all of the design details, I can report that the instrument input stage uses a pair of bipolar transistors in a configuration Phoenix Audio have dubbed a ‘Manx‑tailed pair’. Students of electronics will be able to relate that term to the classic ‘long‑tailed pair’ topology and know that ‘bootstrapping’ techniques are often used to raise the input impedance in bipolar transistor gain stages — and I imagine a variation on that idea is being employed here. In my discussions with Phoenix Audio product designer Shaun Leveque about the circuit design, I also learned that, unlike many other ‘musically flavoured’ DI devices, the N‑8 doesn’t rely on saturating the output transformer for its sound character. Instead, this comes entirely from the output‑stage circuitry and the specific way in which it is loaded and biased via the output transformer. This is important: with the transformer only providing isolation and not tonal colour, the monitor outputs sound exactly the same as the main outputs (albeit 8dB quieter), despite the former being derived from the primary winding and the latter from the secondary! If the tonal character came from transformer saturation effects that wouldn’t be the case, and the recorded sound would be significantly different from the monitoring outputs. With all the Class‑A circuitry and output transformers, there really is no room to spare for a built‑in power supply! Like the classic Neve hardware that inspired the underlying circuit design, the N‑8 runs on a single‑sided +24V DC power rail but, unlike the two‑channel Nice DI, this product is powered from an external line‑lump universal PSU which accepts mains supply voltages of 100‑240 V AC. Regular readers will know that I’m not generally the world’s biggest fan of such external supplies, but in this case I think it’s sensible — lifting the lid on the case, I could immediately see that, due to the profusion of transformers and DSOP‑2 modules, there simply isn’t enough space for an internal power supply; and were the case to be made deeper to accommodate an internal supply, the unit’s weight (and thus leverage exerted on the front panel when racked, as intended) would be problematic. A nice, screw‑locking, three‑pin Amphenol‑Tuchel chassis plug accepts the 24V DC power from the supplied line‑lump class‑1 (earthed) PSU. I approve of that, as the connection is so much more secure and reassuring than the ubiquitous coaxial plugs. Of course, an external PSU also reduces the heat inside the case and minimises the risk of mains hum being induced into the transformers. All in all, it seems to me to be a sensible compromise. There is no power switch, so the N‑8 is powered up whenever the line‑lump power supply is receiving mains electricity. As I always do for hardware reviews, I put the N‑8 on my test bench and performed a standard PAT test before starting to use it, and I was surprised to see the PAT tester indicate that the case metalwork wasn’t earthed back to the mains plug. To be completely clear, there is no safety issue at all here — technically, since the N‑8 has an internationally certified external low‑voltage PSU, the chassis doesn’t actually need a mains safety earth connection. Initially I presumed this was a deliberate design feature for mitigation of ground loops, but I subsequently discovered that the mains safety earth connection is actually extended onto the unit’s motherboard as the negative side of the DC power supply. This then becomes the audio signal ground reference, and so it’s carried through to all the front‑panel instrument socket sleeve terminals and main output cable screen connections. This means that all the audio socket grounds link back directly to the mains safety earth, while the unit’s metal case doesn’t — though, of course, in most practical installations the chassis metalwork will become grounded when mounted in a rack. For stand‑alone operation, it is also possible, fairly easily, to extend the mains earth to the chassis to ensure effective screening by installing a wire link between the appropriate motherboard terminals — although I could find no mention of this option in the manual. While there’s a valid technical argument for the absence of chassis grounding (it avoids creating a secondary ground loop through the rack, which can be a real problem with some elderly hardware), it is unusual and I’d have preferred, at the very least, to see the user manual explain the situation clearly, and to spell out the options for grounding the chassis if required. Running through a range of bench tests using an Audio Precision system, I found the output level control provided a maximum gain of +30.5dB with the control fully clockwise. With the knob at 12 o’clock the boost was around +15dB, and at the fully counter‑clockwise position it attenuated the signal by around ‑50dB — effectively turning it off. This control has a detented action and the second click gave around 40dB of attenuation, the third about 16dB, while the fourth achieved roughly unity gain. With an input signal at ‑20dBu (nominal instrument level), and the output level adjusted for a nominal +4dBu line level, I measured the total harmonic distortion (THD) figure at a respectable 0.05 percent, and the noise floor was ‑83dBu. So with a maximum output level capability of +26dBu the unit has an admirable dynamic range potential of 110dB. As the input level is increased the distortion level builds progressively to around 0.1 percent before tipping into asymmetrical clipping. The input stage clips when the unbalanced input exceeds about +9dBu, but selecting the input pad allows levels of at least +20dBu to be accommodated without clipping (this being the test limit for the unbalanced output of my Audio Precision system). I should state that this overload behaviour is notably different to earlier incarnations of the N‑8 (the review model had serial number #3484), and the input cards had several wire links added which were absent from earlier models. The first review model (#3053) had the pad circuit located after the active input stage rather than before, and so the pad switch did not increase the input headroom at all (the earlier design also clipped at +3dBu). When I raised these issues with Phoenix they requested the opportunity to rework the design, and I’m very pleased to report that the modifications exhibited in this second review unit are most welcome and very effective. As a direct result, not only is there considerably more headroom for instrument inputs, but the N‑8 can also be used to introduce some subtle Neve‑ish coloration to line‑level signals — something that greatly expands its versatility and cost‑effectiveness. Clipping at +9dBu (without the pad) should provide more than enough headroom for most standard instruments, even active basses and very hot guitar pickups, but the pad is available if more headroom is required. I didn’t experience any problems playing a conventional passive bass through the N‑8, or when recording a friend playing an electric guitar. When the guitarist really dug in and deliberately pushed the input stage into overdrive he liked the result — and I’m sure others will like it too. Taking a frequency response measurement showed a low‑frequency roll‑off of ‑3dB at 18Hz, and the high end was flat to well beyond 50kHz, so the N‑8 certainly ticks the ‘wide‑bandwidth’ box. I measured a gentle rise in the response above 30kHz due to the output transformer’s resonance, but this was when effectively unterminated (the AP Analyzer presents a very high 200kΩ input impedance by default), and the actual HF response in typical applications will be substantially flat (or gently falling) in this ultrasonic region, as a more conventional destination’s input impedance will inherently tame the output transformer’s resonance. Overall, the N‑8’s concept is a great one — classic discrete Class‑A circuitry throughout, a custom output transformer with a high headroom margin, and eight channels in a well‑built rackmounting unit. Instruments captured through the N‑8 sound very good indeed, and its unusually high input impedance really does help electro‑acoustic instruments to sing, with detailed transients, plenty of character, and smooth sustains. On top of that, the N‑8 is very versatile, as it can be used not only as a DI but also to apply a little ‘polish’ to line‑level sources by introducing some high‑headroom, Class‑A character, with some iron in the signal path. This extends the N‑8’s role far beyond simple instrument tracking into mixing and post‑production, which for many prospective users will help to justify its purchase price considerably. There’s nothing directly comparable with the Phoenix Audio N‑8, though if your needs would be met by two channels you might consider Phoenix’s Nice DI. For more conventional DI applications, Radial offer the ProD8, which is a very clean and capable eight‑channel rackmount transformer DI. Originally set up in the UK in the mid ’90s by former Neve engineers, Phoenix Audio started out servicing classic Neve mixing consoles and associated equipment, but it wasn’t long before the company launched a retrofitable output stage upgrade for classic Neve gear (originally called the TF‑1, but now evolved into the DSOP‑2). Next came a Class‑A active DI stage, and the company subsequently started designing and building their own products using more modern, but still discrete, Class‑A circuitry, inspired by the illustrious early Neve consoles. In 2009 Phoenix Audio relocated to California — home to a significant chunk of their market — and they have continued to build both their reputation and product portfolio, under the direction of company president Robin Ashley. Lovely, full-bodied sound, with attractive musically appropriate overdrive behaviour. Though billed as a DI, it doubles up as a characterful eight-channel line amp. Uses Phoenix’s highly regarded DSOP-2 output stages. Ground-lift switches on main transformer outputs, and ground-free monitor outputs. Although not a safety issue, the chassis is not grounded. This eight-channel DI and line amp is inspired by classic Neve Class-A discrete circuitry and offers the musical coloration that this would lead you to expect.